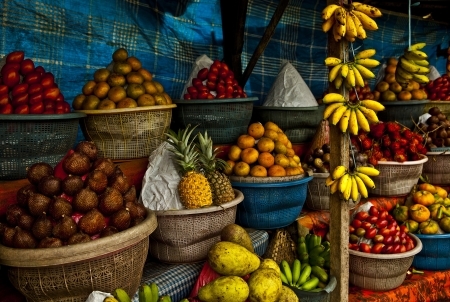 In keeping with our foodie theme this month, here’s a cheerful pic of tropical fruits in a Bali market. We’ve identified finger bananas, pineapples, rambutans, persimmons and pears on there – can you name any of the others? The reason we have food on the brain is because we launched a new website this month: Scoffopedia.com – the language of food and drink, explained. Do pop over and have a look. You’ll never be flummoxed by a menu again! This entry was posted	on Sunday 30 April 2017 at 15:54	and is filed under 2017, Indonesia. You can follow any responses to this entry through the RSS 2.0 feed. You can leave a response, or trackback from your own site.